Pilgrim’s Bakehouse is keeping pace in innovative and healthy foods with the only authentic European Stone Hearth Oven in Coeur d’Alene and North Idaho. Following in the footsteps of the time-honored traditions of Europe, Pilgrim’s Bakehouse staff handcraft scrumptious recipes and bake delectable European-style hearth loaves to bring you a daily bread you can truly savor breaking with your family. 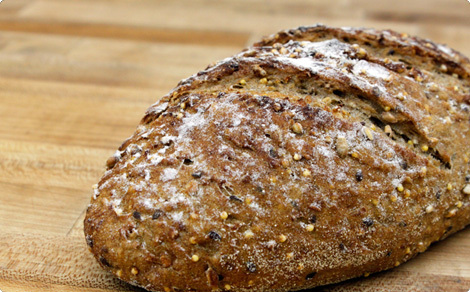 With gluten free and dairy free traditional artisan breads made with organic ingredients, as well as crusty fresh French baguettes and flavors like Jalapeno Olive Cheddar, 5 Seed and Cranberry Walnut, there is something warm and enticing for every palate and diet. Free of chemicals, preservatives and artificial ingredients, these breads are simple and delicious. In addition to hearty European loaves made fresh daily, Pilgrim’s Bakehouse also creates quite the menu of scrumptious cakes, cupcakes, muffins, tarts, scones, croissants, pies and more to satisfy any sweet tooth, including vegan's, vegetarians and the gluten intolerant. Every day is a culinary “science project” as Pilgrim’s Bakehouse pastry chefs consistently turn out beautiful and delicious edibles, made from the highest quality organic and natural ingredients they can find. And the resulting culinary delights speak for themselves. Come experience the Pilgrim's natural grocers way.